I have to admit that Sytli-Style is one of those brand you just don't think to check out that often but I took notice again looking for a spot concealer that would be purse friendly and also fund these new Give me Lip pencils. I bought these at Rexall, Give me Lip 9.99CAN and Cool & Covered 12.99CAN. 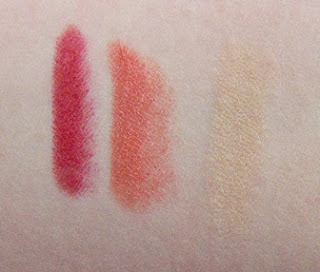 Give Me Lip pencils are creamy lip colour that dry down to a more satin/matte finish on the lips. Cool & Covered concealers has a waxier texture when using but their still easy to blend out with your finger. All the 6 shades of the shade Give Me Lip pencils pretty much apply exactly like you see in the pencil. Really all the bold shades. 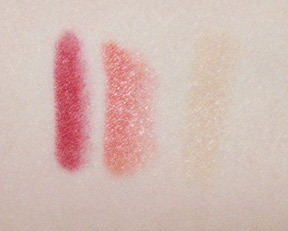 Wear: Give Me Lip pencils close to 6 hours wear not bad at all! You will will be stained also even with the lightest shade Disco 70's. I did see noticeable fading after 8 hours with the Cool & Covered concealer but the redness i wanted to spot conceal for blemish did still stay hidden without setting is with a powder. Packaging: Cool & Covered is Twist up crayon while Give Me Lip pencils have to be sharpened. Urban Decay in 24/7 Concealer is a thicker formulation then the Cool & Covered. But for my purpose it look strange spot concealer with the Urban Decay in 24/7 Concealer without foundation is look like my face had hot spot considering I'm so freckled. For spot concealing with a face powder or tinted moisturiser this is my more ideal for me as but blend in nicely with my tone and kid but the redness of a blemish. Sytli-Style Give me Lip 0.06 oz as a pencil means your sharpening out more product then say Urban Decay Super-Saturated (0.1oz), and the Milani Lip Flash in Flashy (.1oz) But this formulation is also different and I find it easier to sharpen without the product mushing up as you go unlike a softer lip formula. The Give Me Lip pencils are really Sucker Punch Bold, there is not a single timid shade in the line! If your looking for medium coverage concealer I recommend checking out the Sytli-Style Cool & Covered.